Here is an awesome advertisement from Blue Devil #1 (June 1984). I’ve mentioned it here before, but Blue Devil is one of my top five favorite superheroes. I think this ad really captures the fun of the series. All the facial expressions are smiling and cheerful, Blue Devil is leaping into action, and there is just an overall up-beat attitude to the ad. Check out the size of BD’s horns! They’re friggin’ huge! I can’t explain it, but exaggerated features like this just add to the image, rather than detract. 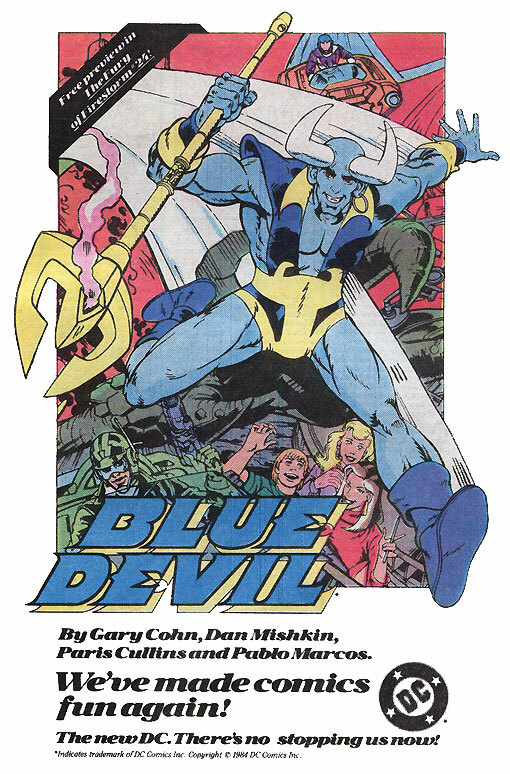 Not wishing to sound like a numptie, but whatever happened to Blue Devil? If you haven’t done this already, I’d love to know who your top 5 are (OK, I know Aquaman and Firestorm are two of them) and why. Thanks for the comments. Watch this space for more Blue Devil stuff soon! Erika – Firestorm, Blue Devil, Aquaman, Doctor Fate, and Flash. In that order. I’ve already dedicated a week to Aquaman and Flash, and have a separate Firestorm blog. Sooner or later I’ll do a Doctor Fate and Blue Devil week. Widge – LOL! Seriously! Hours after reading your comment, I’m still laughing!